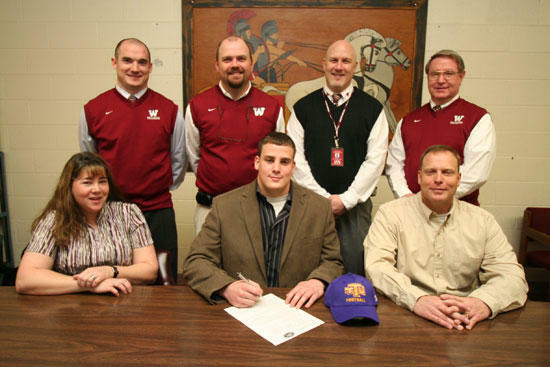 Nathan Bush, center, is shown signing scholarship papers to play at Tennessee Tech as his parents, Lydia and Brent, and Hamblen-West coaches join in on the ceremony. The son of a former Woodbury couple and the grandson of current Woodbury residents Dale and Lynn Bush and Boyd and Helon Gentry has received a scholarship to play football at Tennessee Tech University in Cookeville. Nathan Bush, the son of Brent and Lydia Bush, was a strong two-way player for Hamblen-West High School in Morristown, Tenn. and coaches Don Woods and Lamar Brown. Nathan anchored both the offensive and defensive lines for the Trojans. A 6-5, 270-pound lineman, Nathan was a four-year letterwinner in football and he also earned letters in basketball and swimming. He piled up 62 tackles, 12 tackles-for-loss and four sacks as a senior and was named to the Toyota East-West Tennessee All-Star game and the Kentucky-Tennessee National Guard Border Bowl. Twice a first-team all-conference pick, he was a second-team All-State selection as a junior. For his career, Nathan had 151 total tackles, 12 quarterback sacks and 30 tackles-for-loss. Congratulations, Nathan! We are very happy you are going to be playing close to home so we can come and cheer you on!